Тії г Си ban Missile Crisis—the American blockade. Cuba is an island nation only ninety miles from the coast of the United States. In 1959 a revolution­ary reformer named Fidel Castro took over its government. Cuba’s banks, railroads and many other businesses were owned by Americans at this time. So, too, were many of its big sugar plantations. Castro needed money to make changes it! Cuba. To obtain it he began to take over American – owned businesses. In the opinion of the United States government this was stealing American property. Not only this, but Castro seemed to be organizing a communist state right on the door­step of the United States. In 1960 President Eisenhower agreed to give weapons and ships to refugees from Cuba who wanted to overthrow Castro. When Eisenhower retired in January, 1961, the plan was supported also by the new President, John F. Kennedy. On April 17, 1961, a force of 1,400 anti-Castro Cubans landed at the Bay of Pigs on Cuba’s south coast. Castro had tanks and 20,000 men waiting. Within days the invaders were all captured or killed. But Castro believed that Kennedy would attack again, so he asked the Soviet Union for help. Khrushchev sent him shiploads of rifles, tanks, and aircraft. Kennedy grew worried and ordered a close watch to be kept on Cuba. On Sunday, October 14, 1962, an American U-2 spy plane flew high over the island taking photo­graphs. They showed Russian missile launching sites being built. What had happened was this: Ever since the U-2 incident of 1960 Khrushchev had been making threats against the United States. These had alarmed Kennedy. Although the Americans already had more long-range missiles than the Russians, Kennedy ordered nearly a thousand more. The new missiles tipped the “balance of terror” strongly in favor of the United States. When Castro asked for help, Khrushchev saw a chance to level up the balance of terror. He ’would threaten the United States from missile bases on its own doorstep-Cuba. Kennedy was shocked by the U-2 photographs. “This is the week 1 better earn my salary," he said grimly. Some advisers wanted him to send bom­bers to destroy the missile bases. He also thought about sending American soldiers to capture them. But instead he ordered American ships and aircraft to set up a blockade. 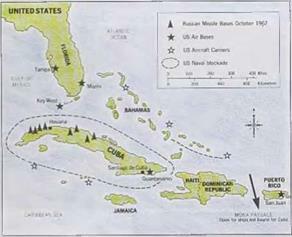 They were to stop any Soviet ships carrying more missile equipment to Cuba. Kennedy then told Khrushchev to take away the Soviet missiles and destroy the bases. He warned that any missile fired from Cuba would be treated as a direct Soviet attack on the United States and ordered 156 long-range missiles aimed at the Soviet Union to be made ready to fire. For ten terrifying days in October 1962, the world trembled on the edge of nuclear war. 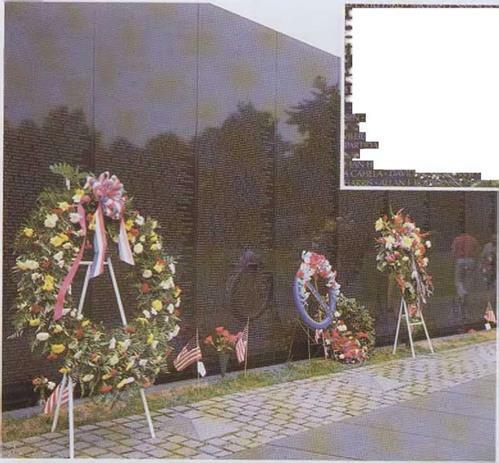 People waited in fear for the next news flash on their radios and televisions. Finally Khrushchev ordered his technicians in Cuba to destroy the launching sites and return the missiles to the Soviet Union. In return, Kennedy called off the blockade and promised to leave Cuba alone. Privately, he also agreed to remove American missiles sited on the border of the Soviet Union in Turkey. The most dangerous crisis of the Cold War was over. just after midnight on Sunday, August 13, 1961, trucks rolled through the silent streets of hast Berlin. At the border with West Berlin soldiers jumped out and blocked the streets with coils of barbed wire. By morning they had closed off all but twelve of the eighty crossing points to West Berlin. Within days workmen were replacing the barbed wire with a lasting barrier of concrete. 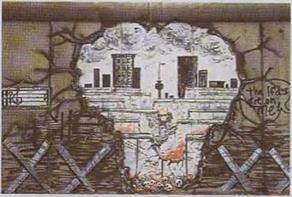 The Berlin Wall had been born. To understand why the Berlin Wall was built we have to go back to the late 1940s. Since its formation in 1949 West Germany had prospered. By 1961 its people were among the best-off in the world. East Germans were less fortunate. Their wages were lower. They had less to buy in the shops, less chance to speak their minds. Millions fled to the West. The easiest way to do this was to catch a train from East to West Berlin and not bother to come back. Berlin —the writing оя the wail. without such people. They built the Wall to stop any more from leaving. President Kennedy was not prepared to risk war by demolishing the Berlin Wall. But he made it clear that the United States would not let the communists take over West Berlin. For almost thirty years Berlin became two separ­ate cities. It was not until 1989 that its people tore down the Wall as a first step towards re-uniting their city. President Kennedy’s proposal in May 1961 that the United States should send a man to the moon was eagerly welcomed by politicians and the American people. 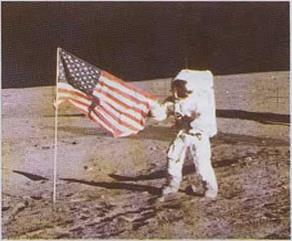 Soon work had begun on the Apollo program, as the project was named. The Apollo program was another move in the “space race” between the United States and the Soviet Union. The costs of this race were enor­mous. But there were two important reasons why both the Americans and the Russians were willing to pay them. First, there was the question of international prestige-of gaining the respect of the rest of the world by achieving something calling for immense scientific and technical skill. Secondly, both Americans and Russians felt that to let the other side get too far ahead in space technology would endanger their security. Earth­orbiting satellites could be used to take spy photographs. More frightening still, rockets cap­able of carrying people into space could also be used to carry nuclear warheads. Up to the mid-1960s each side matched the other’s achievements in the space race. But then the Americans started to draw’ ahead. Finally, they w’ere ready for the mission to put the first men on the moon —Apollo 11.
necessary they would drop nuclear bombs on the Soviet Union and China. By the mid-1950s the United States had a powerful force of nuclear bombers ready to do this. On airfields all round the w’orld giant American planes were constantly on the alert, ready to take off at a moment’s notice. :W/ Літгігон# on the moan. pilot the section of the spacecraft that would actually land on the moon’s surface, the lunar module. Collins had the job of circling the moon in the other section of the spacecraft, the command module, waiting for their return. The final countdown started five days before blast off. At last, on July 16, 1969, burning 4’/2 tons of fuel a second, a huge 5,000 ton rocket rose slowly from its launching pad on a roaring column of flame. Five days later millions of television view’ers all over the world watched Armstrong and Aldrin step down on to the surface of the moon. The two men spent three hours collecting rock samples and setting up scientific instruments on the moon’s surface to send information back to earth after they left. Then they rejoined Collins in the command module. Three days later they splashed down safely in the Pacific Ocean and helicopters carried them off to a heroes’ welcome. earth satellite, the Sputnik. Sputnik did not worry the Americans. But the rocket that carried it into space did. A rocket powerful enough to do that could also carry an I I-bomb to its target. over the United States, ready to carry their deadly warheads far into the Soviet Union. The Polaris, another missile, was carried by nuclcar-powcrcd submarines cruising deep beneath the oceans. By the end of the 1950s the United States and the Soviet Union had enough nuclear missiles to kill everybody on earth. It is not surprising that people spoke of a “balance of terror.” Both Russian and American leaders came to sec that in a full-scale war between their two countries there could be no winner. They would simply destroy one another. President Eisenhower welcomed Khrushchev’s talk of peaceful coexistence. He invited the Soviet leader to visit the United States. Afterwards the two men agreed to hold a summit meeting in Paris to work out solutions to some of their differences. The Paris summit never even started. As the leaders were on their way there in May I960, a Russian missile shot down an American aircraft over the Soviet Union. The aircraft was a U-2 spy plane, specially designed to take photographs of military targets from the edge of space. Krushchev angrily accused Eisenhower of planning for war while talking peace. He went angrily back to the Soviet Union. He seemed to be furious. But maybe he was rather pleased at having made the Americans look like hypocrites. In any case, the Paris summit meeting was over before it even started. The bomb exploded in a blinding burst of green – white light. The fireball at its center grew into a towering pillar of flame. A huge, colored mushroom of poisonous cloud boiled high into the skv. It was November 1952. American scientists testing a new weapon had blasted a whole uninhabited island out of the Pacific Ocean. They had exploded the first hydrogen, or H-bomb. The H-bomb was many times more destructive than the atomic, or A-bomb, that destroyed Hiroshima. 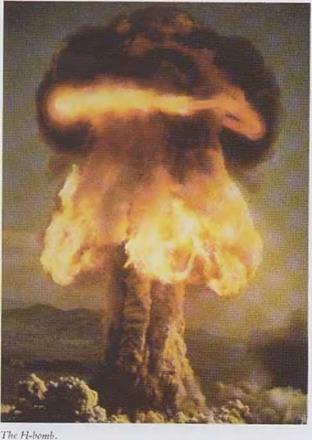 Just one H-bomb had five times the destructive power of all the bombs dropped in five years of the Second World War. By 1953 the Russians, too, had made an I I-bomb. By 1957 so had the British. But only the Americans and the Russians could afford to go on making them. The fact that both the Umtcd States and the Soviet Union had H-bombs determined how they behaved towards one another for years to come. That same November of 1952 Dwight D. Eisenhower became President. American Presidents appoint a Secretary of State to take charge of the United States’ dealings with foreign countries. Eisenhower gave this job tojohn Foster Dulles. Dulles was a man of strong moral convictions. He genuinely believed that communism was evil. Truman, Dulles claimed, had not been tough enough with the Soviet Union. His own idea was for the United States to take the offensive. Instead of being content simply to contain communism ("a cringing policy of the fearful,” as he called it) the United States should set out to “liberate” nations already under communist rule. In a broadcast in 1953 he told the peoples of eastern Europe that they could trust the United States to help them. In 1956 the people of Hungary put Dulles’s promise to the test. They had been under Soviet control since 1946. Now they rose in rebellion against their communist rulers. When Russian tanks rolled in to crush them they sent out desperate appeals for help. The help never came. Thousands of refugees fled across the Iron Curtain to safety in the neighboring country of Austria. “We can never believe the west again, ” one of them told a reporter. Dulles failed to help the Hungarians because he knew’ that doing so would mean war with the Soviet Union, The devastation of nuclear war was, he decided, too high a price to pay for “rolling back” the Iron Curtain. In the years after 1945 the non-communist govern­ments of Western Europe looked uneasily at the huge Russian armies grouped just behind the barbed-wire fences of the Iron Curtain. They feared that Stalin might order his soldiers to over­run them. In February 1948, their fears increased. With Russian support a communist government took control in Czechoslovakia. Then, in June, Stalin started the blockade of Berlin. These events convinced President Truman that Western Europe needed more than economic aid. in 1949 he invited most of its nations to join the United States in setting up the North Atlantic Treaty Organization (NATO). This was an alliance of nations who agreed to support one another against threats from the Russians and set up combined armed forces to do this. The North Atlantic Tieacy was signed in Washing­ton in April 1949. The following September Americans heard the news that the Russians, too, could now make atomic bombs. This persuaded Congress to vote millions of dollars to equip NATO’s armed forces. In 1951 General Eisen­hower, one of the United States’ best known generals of the Second World War, was placed in command of these forces. Soon thousands of American soldiers were in Europe once more. ended was the death of Stalin, who had been encouraging the Chinese to fight on. Another was the fact that the ncwly-clcctcd President Eisenhower hinted that the Americans might use atomic weapons if the Chinese did not sign a cease-fire. The cease-fire left Korea still divided more or less along the line of the 38th parallel. One Korean in every ten had been killed and millions made homeless. Yet both sides claimed that they had won a kind of victory. The Chinese said that they had proved that nobody need. be afraid of opposing the Americans. The Americans said that they had shown communists everywhere that it did not pay to try to spread their rule by force. More than 33,000 Americans had died in Korea and over 100,000 more had been wounded. Containment in Asia had been expensive. But the Americans felt that it had worked.